Nelson County offers many fishing opportunities along its rivers, lakes and streams, including the Tye River, James River, Little Piney River (stream) and Rockfish River. Visit the Virginia Department of Game & Inland Fisheries for fishing rules & regulations. 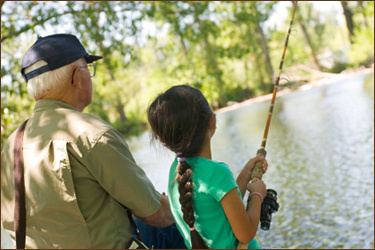 Get information on purchasing fishing licenses and access permits. 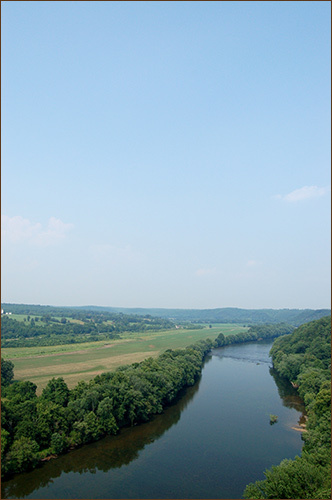 The Tye River is a 35.4-mile-long tributary of the James River in central Virginia originating on the eastern slope of the Blue Ridge Mountains in Nelson County, and is fed by the Piney and Buffalo rivers. It joins with the James River near Norwood, in Nelson County, VA. The Tye River is home to dozens of species of fish and other aquatic life, including largemouth bass, smallmouth bass and bluegill. Browns, rainbows and brooks can be taken on a fly by the studious angler. The Tye River is stocked with catchable-sized trout periodically by the Virginia Department of Game and Inland Fisheries from October through May. See the TROUT STOCKING SCHEDULES for their stocking plan. Virginia Fishing License required. Trout license also required between October 1 and June 15. Little Piney River is a stream located at the junction of Rt. 666 and Woodson, at the southern part of Nelson County near Lowesville, VA. Fishermen will find a variety of fish including largemouth bass, smallmouth bass and bluegill here. Be sure to check with VIRGINIA DEPARTMENT OF GAME AND INLAND FISHERIES to ensure the stream is open to the public, and that you have the necessary fishing license. From the confluence of the Jackson and Cowpasture Rivers in Botetourt County, downstream to Richmond, the James River offers a wide range of angling opportunities and settings. Smallmouth bass are the dominant game species, but spotted and largemouth bass can also be caught. Smallmouth bass fishing can be good throughout the river. Both the mountain sections (upstream from Lynchburg) and the piedmont sections (between Lynchburg and Richmond) generally provide good fishing. Other species are also plentiful in the James River, including channel catfish, flathead catfish, and various sunfish species (redbreast, bluegill, and rock bass). Flathead catfish appear to be more numerous upstream from Lynchburg, and channel catfish are more numerous below Lynchburg. Muskies are also annually stocked in the James. These fish are scarce, but some very large fish can be caught. Most of the muskies are found upstream from Lynchburg. Overall, the James River offers an excellent fishing opportunity for whatever you might want. Canoeing is the best way to access the river. Small boats (such as john boats) can also be used at most access points. Bank and wade fishing access is also available throughout the river. Virginia Fishing License(s) are required. The Rockfish River (South) is stocked with catchable-sized trout periodically by the Virginia Department of Game and Inland Fisheries from October through May. See the TROUT STOCKING SCHEDULE for their stocking plan. Virginia Fishing License required. Trout license also required between October 1 and June 15. Access Points: put-in by the bridge on Route 6 and take-out at the Nelson County Wayside on Rt. 29. Take the kids to Montebello and catch some Rainbow Trout in the fee base trout ponds. An assortment of fishing poles in both adult and children sizes, fishing line, a variety of lures as well as live and artificial bait available in the country store. No license required. The Montebello Fish Hatchery is a few minutes west of Crabtree Falls (off Rt. 56) with separate holding pens for the different species of fish, as well as the different sizes. This hatchery produces and stocks streams around Virginia with 150,000 Brook, Rainbow and Brown Trout each year. Fun for kids too – see where these fish come from! 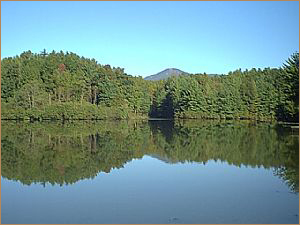 Lake Monocan is a 20-acre lake and park located at Stoney Creek in Nellysford. Canoes, kayaks, paddle boats, fishing equipment, road bike rentals, horseshoe pits, sand volleyball court, sandy beach, lounge chairs, picnic area and outdoor charcoal grills are available. Some fees apply. Lake Monocan is open Memorial Day Weekend through Labor Day. 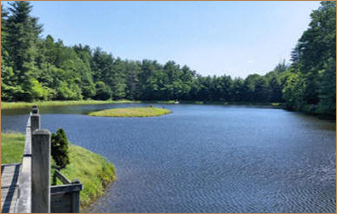 Wintergreen Resort members and all registered resort guests have complimentary access to Lake Monocan Park. You will need to present a proper ID or pass for complimentary access. Public Lake Access Sunday – Friday only. Fee. Nestled in 11,000 acres in the Blue Ridge Mountains, WINTERGREEN RESORT is in close proximity to some of the best fly fishing Virginia has to offer. Wintergreen’s Fly Fishing services are designed to accommodate the inexperienced to the expert angler. Wintergreen’s Orvis-Endorsed instructors have the perfect classroom setting at Lake Monocan to introduce students to the art of Fly Fishing, or anglers can experience the thrill of fishing for trout in the mountains or smallmouth bass on the legendary James River with a knowledgeable and friendly guide. Due to limited availability, please call well in advance for bookings. Wintergreen offers half and full day Fly Fishing Classes. Fly-casting instruction is based on The Orvis Progressive Method to Fly Casting and inexperienced to expert casters are welcome. All instruction includes the use of Orvis fly rods and equipment, and all classes are held at the facilities at Lake Monocan and on the private ponds in Stoney Creek.